Original Church burned in the fire of 1917 and was rebuilt in it's present forn betwwen 1920-1923. 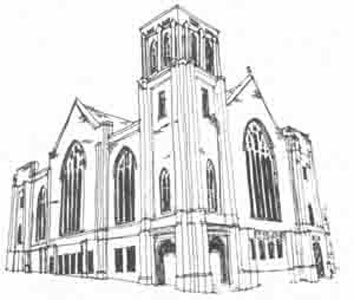 Architectural Style: The Church Building represents a late adaptation of the Gothic Revival style. 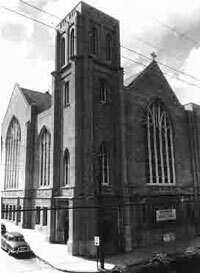 Original Use: Has been an important spiritual/social institution in the Sweet Auburn Ave. Community since inception. The church contains 22 class and department rooms, a vault and 2,500 seats in the main auditorium. Readaptive Use: Continues functioning as a community church. 1894- J.S. Brandon begins plans to organize a Young Men's Christian Association. A group of young people meet in the basement of the Wheat Street Baptist Church to formalize the group. Brandon is elected president and his sister-in-law, Hattie Askidge, is elected organist. The dominant activity during the early years was song and prayer on Sunday afternoons. 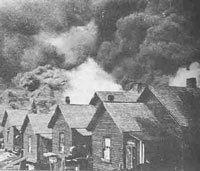 1917- The fire of 1917 wipes out the original Church as well as much of north eastern Atlanta. 1921-August. Construction begins on the new Wheat Street Baptist Church at the corner of Auburn Ave. and Yonge St. (Now William Holmes Borders Dr.) The church would contain 22 class and department rooms, a vault and 2,500 seats in the main auditorium. Rev. Peter James was pastor. The Church has been in its finished state since 1939. 1936 -the late Rev. Peter J. Bryant (he originally sold Alonzo Herndon the Atlanta Benevolent & Protective Association) was replaced by the demonstrative young preacher from Macon, The Rev. William Holmes Borders. Late 1930's From Parting the Waters by Taylor Branch p53-54. 1961 From Parting the Waters by Taylor Branch p301-302. NARRATOR: The Voters League would interview candidates and endorse those who best-supported black interests.